Halloween is just around the corner, but scary creatures aren’t just carrying out their mischievous deeds on this night! When it comes to website optimization, there are certain things that just sometimes don’t seem to work properly. This is because of the dreaded monsters of website optimization. They strike when you least expect it, and they ruin your optimal website performance. In this article, we’ll show you how you can fight off these five monsters the Ryte way, just in time for Halloween. This nasty monster loves to create a big mess of internal links. It twists the statements of your Anchor texts so that they don’t contain meaningful keywords or descriptive information about the target page of the link. Not only does it confuse the search engines, it also confuses the reader. 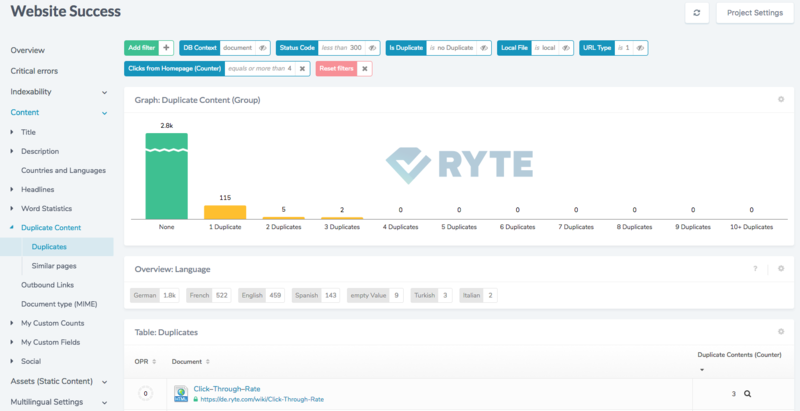 With the help of Ryte, you can identify which anchor texts have been affected by this monster in just a few steps. Click on the “Anchor Texts” report in the “Links” → “Link Overview” section of the Website Success module. Using the displayed target documents, you can now quickly assign relevant keywords to the link texts and optimize your internal linking. Long loading times are the conversion killer. If you see only a boring loading bar when you visit your website, the monster of slow page speed must have struck. It gathers slow databases as well as large images and videos, slowing down the performance of your website. The performance report in the Website Success module can help you analyze your server performance and identify potential for improvement. By clicking on “Load times”, you not only get an overview of all loading times of your website, you also see at a glance, for example, to which files your server reacts very slowly, or which files have already been compressed. You can also filter for “very slow” URLs to determine with which files your server is responding too fast. This deceitful monster practices its secret duplicate content arts subtly. Similar content that appears under different URLs or even different domains makes it difficult for search engines to decide which is the most relevant search result. Operators of online shops have to deal with this fiend in particular. By calling up the report “Content” → “Duplicate Content” → “Duplicates” in the module Website Success, you can see all internal duplicates including the URLs at a glance. By clicking on the magnifying glass in the column “Duplicate Counter” all URLs will be displayed. The different colors show you the level of optimization. By clicking on the magnifying glass you will receive further information about all duplicates in connection with the respective page, and you can start with your optimization. This troublemaker helps the Duplicate Content Monster confuse the search engines on their search for unique content. Even though the Canonical Tag is actually an effective solution against duplicate content, errors can frequently occur when using it. Be careful – an incorrectly set Canonical tag can cause Google to completely ignore your website. To keep the monster in check, you can find the canonical tag evaluation under “Indexability” → “Canonicals” → “Usage” in the module Website Success. To identify wrong canonical tags, pay special attention to the display “Not set”. Here you will find all documents without a canonical tag. To find out if a canonical tag points to a 404 error page, you can look under “Indexability” → “Canonicals” → “Status Codes”. By clicking on the 404 status codes, you can set a filter and you will see only the canonical destinations with a 4xx status. This lonely but treacherous monster has lost the reference to the other pages of your domain, and is therefore often not noticed. This is where the danger lies, because pages that have no incoming links cannot be crawled by the search engine bots and therefore interrupt the crawling process. You should definitely identify these orphaned pages as part of your website optimiztion. Under the menu item “Links” → “Pages without incoming links” in the Website Success Module, all orphaned pages of your domain are displayed in a flash. You can therefore see which pages you need to link to pages with relevant topics, and you should remember to update your XML sitemap. We hope we have given you enough garlic and crucifixes for the hunt for the monsters. Now it’s up to you: Tell the evil monsters to fight with Ryte! 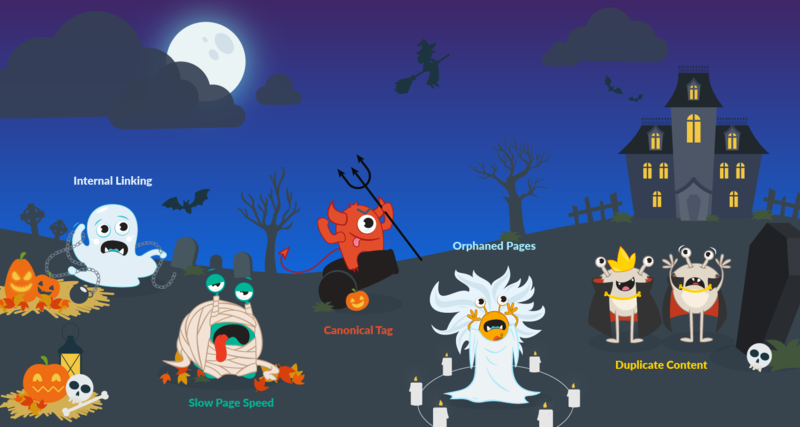 Ryte wishes you all the best in optimizing your website and of course – Happy Halloween! Published on 10/25/2017 by Kristina Schreiner. Besides studying for her master's degree in Marketing Management, Kristina supports the marketing team at Ryte. With a touch of humour and unbeatable organizational skills, she helps manage the German Ryte Magazine and Wiki, and assists in event organization.